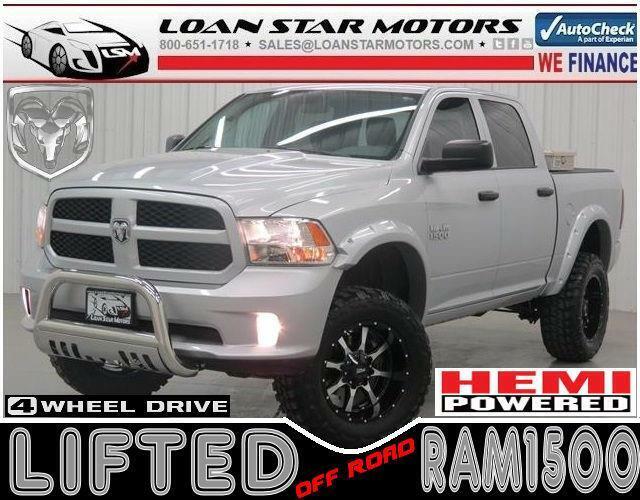 ***LIFTED***2014 Ram 1500 QUAD CAB 4WD 5.7L V8 HEMI LIFTED 4X4 32K MILES FLARES BULL BAR MOTO METALS******32K ORIGINAL MILES***100% AUTOCHECK GUARANTEED***2014 Ram 1500 Tradesman 32k Original 4 Wheel Drive New Lift Rough Country New Tires 35/12.5/20 Tool Boxes***We Finance***WAC*** *** Visit our website at www.loanstarmotors.com t o view 60+ pictures of this vehicle ***WE FINANCE***AS LOW AS 3.99% APR FINANCING ON QUALIFIED VEHICLES W.A.C. ***Another fine pre-owned vehicle offered for sale by Loan Star Motors of North Houston Humble TX * Contact our Sales Department for Complete Details at any Time at Toll Free *** 1- 800-651-1718 *** When Ram created this vehicle with 4 wheel drive, they immediately enhanced the performance ability. Easily switch between two and four wheel drive to take advantage of the improved steering and superior acceleration. It's not a misprint. And the odometer isn't broken. This is a very low mileage Ram 1500. A rare find these days. Driven by many, but adored by more, the Ram 1500 Tradesman 32k Original 4 Wheel Drive Tool Boxes is a perfect addition to any home. More information about the 2014 Ram 1500: The Ram 1500 already offered truck buyers a whole host of reasons to consider it, with power Hemi V8 availability, coilover rear suspension and innovative storage solutions, but with some very effective upgrades in key areas -- namely increased chassis strength, improved base engine power and efficiency and more intuitive interior ergonomics -- the Ram raises the bar for full-size trucks. This model sets itself apart with ample available V8 power with improved V6, Ram-Box bed-side storage, increased fuel efficiency, user-friendly cabins, and Multiple model configurations to suit all needs ***WE OFFER NATIONWIDE FINANCING OPTIONS * COMPETITIVE RATES, DISCOUNTED SHIPPING AND WELCOME TRADES * Extended Warranty Programs/Low APR Financing Available WAC. Physical Address: 5547 FM 1960, Humble TX, 77338-Toll Free 1-800-651-1718 - Visit us on the web at http://www.loanstarmotors.com All advertised prices exclude government fees and taxes, any finance charges, any dealer document preparation charge, and any emission testing charge. The price for listed vehicles as equipped does not include charges such as: License, Title, Registration Fees, State or Local Taxes, Dealer Prep, Smog Fees, Credit Investigation, Optional Credit Insurance, Physical Damage of Liability Insurance, or Delivery Fees. DEALER makes no representations, expressed or implied, to any actual or prospective purchaser or owner of this vehicle as to the existence, ownership, accuracy, description or condition of the listed vehicle's equipment, accessories, price, specials or any warranties. Any and all differences must be addressed prior to the sale of this vehicle. Your actual mileage will vary depending on how you drive and maintain your vehicle. ***32K ORIGINAL MILES***100% AUTOCHECK GUARANTEED**2014 Ram 1500 Tradesman 32k Original 4 Wheel Drive Tool Boxes***We Finance***WAC******Visit our website at www.loanstarmotors.com to view 60+ pictures of this vehicle ***WE FINANCE***AS LOW AS 3.99% APR FINANCING ON QUALIFIED VEHICLES W.A.C. ***Another fine pre-owned vehicle offered for sale by Loan Star Motors of North Houston Humble TX * Contact our Sales Department for Complete Details at any Time at Toll Free ***1-800-651-1718*** When Ram created this vehicle with 4 wheel drive, they immediately enhanced the performance ability. Easily switch between two and four wheel drive to take advantage of the improved steering and superior acceleration. It's not a misprint. And the odometer isn't broken. This is a very low mileage Ram 1500. A rare find these days. Driven by many, but adored by more, the Ram 1500 Tradesman 32k Original 4 Wheel Drive Tool Boxes is a perfect addition to any home. More information about the 2014 Ram 1500: The Ram 1500 already offered truck buyers a whole host of reasons to consider it, with power Hemi V8 availability, coilover rear suspension and innovative storage solutions, but with some very effective upgrades in key areas -- namely increased chassis strength, improved base engine power and efficiency and more intuitive interior ergonomics -- the Ram raises the bar for full-size trucks. This model sets itself apart with ample available V8 power with improved V6, Ram-Box bed-side storage, increased fuel efficiency, user-friendly cabins, and Multiple model configurations to suit all needs ***WE OFFER NATIONWIDE FINANCING OPTIONS * COMPETITIVE RATES, DISCOUNTED SHIPPING AND WELCOME TRADES * Extended Warranty Programs/Low APR Financing Available WAC. Physical Address: 5547 FM 1960, Humble TX, 77338-Toll Free 1-800-651-1718 - Visit us on the web at http://www.loanstarmotors.com All advertised prices exclude government fees and taxes, any finance charges, any dealer document preparation charge, and any emission testing charge. The price for listed vehicles as equipped does not include charges such as: License, Title, Registration Fees, State or Local Taxes, Dealer Prep, Smog Fees, Credit Investigation, Optional Credit Insurance, Physical Damage of Liability Insurance, or Delivery Fees. DEALER makes no representations, expressed or implied, to any actual or prospective purchaser or owner of this vehicle as to the existence, ownership, accuracy, description or condition of the listed vehicle's equipment, accessories, price, specials or any warranties. Any and all differences must be addressed prior to the sale of this vehicle. Your actual mileage will vary depending on how you drive and maintain your vehicle.